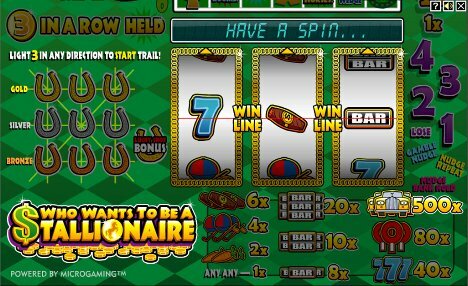 Who Wants To Be A Stallionaire is an online slot machine featuring 3-reels and 1-payline. It was developed by Microgaming and can be played for free of for real money at all Microgaming powered online casinos. When playing for real money, you can wager anywhere from $0.10 per spin all the way up to $10 per spin depending on the denomination that you set. The great thing about the Who Wants To Be A Stallionaire slot machine is that it’s extremely easy to play and at the same time it’s very entertaining! The Who Wants To Be A Stallionaire slot machine features a bonus game, and Nudge feature, and a Hold feature. All three of these features make this game all the more enjoyable to play! In order to activate the bonus round, you will need to collect three Horse Shoes in a row in any direction on the Lucky Shoe rack. The Lucky Shoe bonus feature is random and awards additional Horse Shoes to you. As you are playing the Who Wants To Be A Stallionaire slot machine, you’ll be given the option to nudge or hold the reels from time to time. This occurs and random and allows you to use some skill to control whether you win or lose. Both of these features can also help you get to the bonus round faster, so be sure to take advantage of both of these features to maximize your winning potential! Now that you know a little bit about the Who Wants To Be A Stallionaire slot machine, you’ll be happy to know that you can try out this game for free without leaving this page! Simply scroll down to instantly play the Who Wants To Be A Stallionaire slot machine in your favorite web browser! Luxury Casino is one of the top online casinos that offers the Who Wants To Be A Stallionaire slot game! They are powered by the extremely popular Microgaming software and they have hundreds of great games to choose from; including slots, video poker, blackjack, and more! At the moment, all new players are eligible to receive up to $1000 in free bonus money after making an initial deposit,so head over to Luxury Casino today to take advantage of this great offer! We recommend Guts Casino to all the Who Wants To Be A Stallionaire fans! Right now, all players at this exciting new online casino can get an amazing 300 pounds deposit bonus to try out all of their online casino games! As an added bonus, players are also entitled to receive 100 free spins on the Starburst game in additional free casino money bonuses! If you’re ready to start playing casino games online, we highly recommend doing so at Platinum Play Casino. That’s because this Microgaming powered online casino is currently giving away $1,500 in free casino money to all of their new players with no deposit required! This is a fantastic opportunity to try out all of their real money casino games without risking any of your own money, so head over to Platinum Play Casino today to take advantage of this great offer! Play the Who Wants To Be A Stallionaire slot at Platinum Play Casino! Jackpot City Casino is another great Microgaming powered online casino that is currently offering their new players a free casino bonus with no purchase required. Simply register a new account and you’ll instantly receive $25 in free casino money that you can use to play all of their real money games! You can also get up to $1,600 in free bonus money when you make your first deposit, so head over to Jackpot City Casino today to take advantage of these great offers! Play the Who Wants To Be A Stallionaire slot at Jackpot City Casino! All Slots Casino is one of our favorite places to play online casino games because they have one of the largest selections of games to choose from; including slots, video poker, blackjack, and more! They also have a great new player welcome bonus that you’re sure to love! At the moment, when you register and make your first deposit, All Slots Casino will reward you with up to $500 in free bonus money! Play the Who Wants To Be A Stallionaire slot at All Slots Casino! At Royal Vegas Casino, you can deposit as little as 5-credits and instantly be able to play some of the hottest real money online casino games. They are powered by Microgaming software and they have virtually every game imaginable; including slots, blackjack, video poker, and many others! Right now, Royal Vegas Casino will give you up to $1,200 in free bonus money when you make your first deposit, so head over to their website today to take advantage of this great offer! Play the Who Wants To Be A Stallionaire slot at Royal Vegas Casino! Gaming Club Casino is currently offering all of their new players 30 free spins with no deposit required! They have been around since 1994 and they are considered by many to be one of the most trustworthy online casinos, which is why we never hesitate to recommend them to any of our website visitors! There’s no telling how long their free spins promotion will last, so head over to Gaming Club Casino today to take advantage of this great offer! Play the Who Wants To Be A Stallionaire slot at Gaming Club Casino! All Jackpots Casino is home to some of the largest online casino jackpots and they are well respected throughout the gaming industry, which is why we proudly recommend them to all of our website visitors. They are powered by Microgaming software and they have tons of great games to choose from; including the Who Wants To Be A Stallionaire slot machine! Right now, they are giving away $200 to all of their new players, so head over to All Jackpots Casino today to learn more about this great promotion! Play the Who Wants To Be A Stallionaire slot at All Jackpots Casino! 7 Sultans Casino is one of the most popular online casinos at the moment because they recently lowered their minimum deposit amount to just 1-credit. Now everyone can enjoy playing all of their real money casino games without having to worry about staying on budget! At the moment, you can get up to $1,000 in free bonus money when you register and make your first deposit, so head over to 7 Sultans Casino today to take advantage of this great offer! Play the Who Wants To Be A Stallionaire slot at 7 Sultans Casino! First Web Casino was one of the very first online casinos and they have built a reputation over the years for being one of the most generous online casinos. This is certainly the case when you take a look at their new player welcome bonus, which rewards you with $75 in free casino money after you make your first deposit. There’s no doubt that you’ll love everything First Web Casino has to offer, so head over to their website today to take advantage of this great offer! Play the Who Wants To Be A Stallionaire slot at First Web Casino! Lucky Nugget Casino is a Microgaming powered online casino that is currently home to one of the most generous casino bonuses available online. At the moment, they are giving away up to $1,000 in free casino money to all of their new players! The free bonus money will give your balance an instant boost, which will extend your playing time and increase your chances of winning big! There’s no telling how long this offer will be available for, so head over to Lucky Nugget Casino today to get your free bonus money while this offer lasts! Play the Who Wants To Be A Stallionaire slot at Lucky Nugget Casino! Vegas Palms Casino is one of our favoriThis Microgaming powered online casinos because they have hundreds of Las Vegas style casino games that you can play from the comfort of your own home! They have blackjack, video poker, and plenty of slot machines like the Who Wants To Be A Stallionaire slot machine! At the moment, they are giving away $100 to all of their new players, so check out Vegas Palms Casino today to learn more about this great offer! Play the Who Wants To Be A Stallionaire slot at Vegas Palms Casino! Red Flush Casino is a Microgaming powered online casino that is currently giving away $200 in free bonus money to all of their new players. This online casino has been around for more than a decade and they are well respected throughout the gaming industry, so we have no problem recommending them to any of our website visitors! So if you’re ready to get in on the action and claim your free bonus money, be sure to head over to Red Flush Casino today! Play the Who Wants To Be A Stallionaire slot at Red Flush Casino! At Wild Jack Casino, a trusted and respected Microgaming powered online casino, all new players are currently eligible to receive up to $3,000 in free casino money. This is one of the biggest online casino bonuses that we’ve come across recently, which is why we encourage all of our website visitors to take advantage of this great offer! Visit Wild Jack Casino today to learn how you can get your share of free bonus money before this promotion expires! Play the Who Wants To Be A Stallionaire slot at Wild Jack Casino!